Marta SL Magnesium. REFERENCE! Sabine Spitz won the Olympic gold medal in Beijing with this frein.Pour this exclusive brake, the use of forged magnesium, high performance grip achieves a weight of 315 grams for its lighter version! 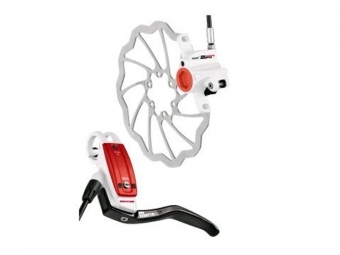 With larger disks (or disk or perforated Ventidisc SL), all Marta can be recommended for All Mountain and Enduro. It is the same for Freeride, we recommend in this case the installation disc in Ventidisc 203 mm! Designed and manufactured in Germany. fully integrated tank (open system). 2-piston fixed caliper with automatic pad wear compensation, one-piece design for maximum stiffness. Check the brake pad wear without disassembly. Handle radial and forged magnesium caliper piston high performance and lightweight carbon lever. Beautiful white finish Race. Marta SL disc: ventilation top and mini in diameters of 160. Titanium screws high quality. EBT technology (Bleed Technology) for fast and easy clearing. Weight | from 315 g / brake disc included. Color | White Race with black / red, carbon lever logo. Trigger and Sram and Rohloff twist grip. Not compatible with Shimano Dual Control. Dual Docking. Triggers can be mounted to the right or left of the brake handle. Other | Also compatible with Ventidisc, SL disk and perforated hose fitting / clamp 90 °.